Judy Asbury studied art in the 1970's in New York City. Since then she has lived in the Jemez Mountains of Northern New Mexico. 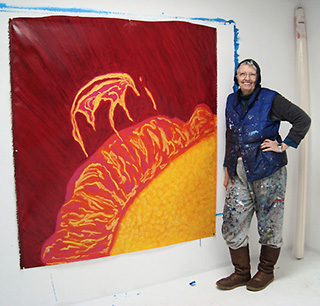 Over the past four decades her paintings have been exhibited in numerous one-person and group exhibitions: International Association of Astronomical Artists exhibition, Moscow, Russia (1988); Basel Art Fair, Switzerland (1989); First International Space Art exhibition, Montreux, Switzerland (1990); Santa Fe Art Institute (2003, 2004); SomArts Gallery, San Francisco (2004); Center for Contemporary Art, Santa Fe (2005); and a prestigious one-person exhibition at the American Museum of Natural History in New York City (1993). Asbury was the finalist in the New York Gottlieb Foundation individual artist grant for 2009.